The economic cost of flood losses worldwide in June will exceed $5 billion, though the insured loss portion will be significantly less, according to Aon Benfield’s latest Global Catastrophe Recap. Impact Forecasting, the cat modeling center of Aon Benfield, reports that major June floods highlighted by China and U.S. events, saw the global economic toll mount. Seasonal “Mei-Yu” monsoon rains led to multiple rounds of significant flooding across central and southern parts of China throughout June, resulting in more than 130 fatalities. The most damaging floods occurred in the Yangtze River basin as rivers and tributaries overflowed their banks and minimally inundated 200,000 homes. Beyond property damage, there were substantial impacts to the agricultural sector. Exceptional rainfall in the U.S. state of West Virginia also led to catastrophic flooding in several counties. The federal government declared a disaster after major damage occurred in Clay, Fayette, Greenbrier, Kanawha, Monroe, Nicholas, Roane, and Summers counties, As many as 5,500 homes and 125 businesses were damaged or destroyed. Additional major flood events in the month of June occurred in India, Indonesia, Myanmar, and Ghana, according to the report. The gap between economic and insured losses for both major flood events in China and the U.S. illustrates the need for greater insurance penetration around the globe. A 2015 Swiss Re report estimated the current annual disaster protection gap between insured and total losses at around $153 billion, assuming an average catastrophe loss year. In absolute terms, the U.S., Japan and China account for more than half that amount, with a combined annual shortfall of $81 billion, Swiss Re said. Multiple outbreaks of severe weather led to a costly month for insurers in the United States in May,Ã‚ as thunderstorm events continued to dominate the catastrophe record. According to the latest Global Catastrophe Recap report by Aon BenfieldÃ¢â‚¬â„¢s Impact Forecasting, no fewer than four stretches of severe weather affected the U.S. during the month of May. 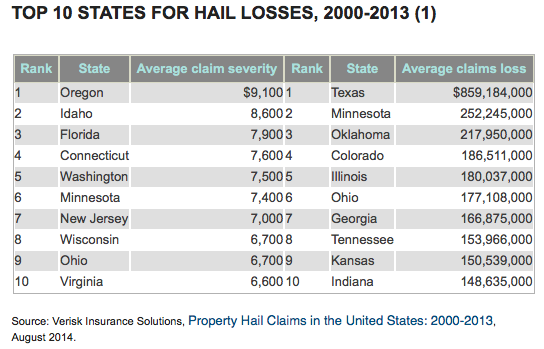 Aggregate insured losses exceeded $2.2 billion and overall economic losses were at least $3.5 billion, with large hail and damaging winds the primary driver of the thunderstorm-related costs, Impact Forecasting reports. The costliest stretch occurred during a five-day period (May 18-23) which saw damage incurred in parts of the Midwest, Plains, Rockies, Mid-Atlantic and the Northeast, including the major metropolitan areas of Chicago, IL and Denver, CO. According to Impact ForecastingÃ¢â‚¬â„¢s report, baseball-sized hail and straight-line winds gusting in excess of 70 mph (110 kph) were recorded that severely affected residential, commercial and auto interests. Total economic losses were estimated at $2.5 billion, with insurers reporting losses minimally at $1.5 billion. Meanwhile, the combination of excessive heat, extreme drought conditions, low relative humidity and gusty winds led to dozens of wildfires across parts of the Texas Panhandle and Southern California, leaving two dead. Overall fire costs/damages from the two states approached $100 million, according to Impact Forecasting. In Texas the most significant fire was in Hutchinson Country, where at least 225 homes and 143 unoccupied structures were damaged or destroyed. In California, at least 14 fires were ignited in the greater San Diego metropolitan region, including the Poinsettia Fire that destroyed eight homes, an 18-unit condominium complex, and two commercial buildings. 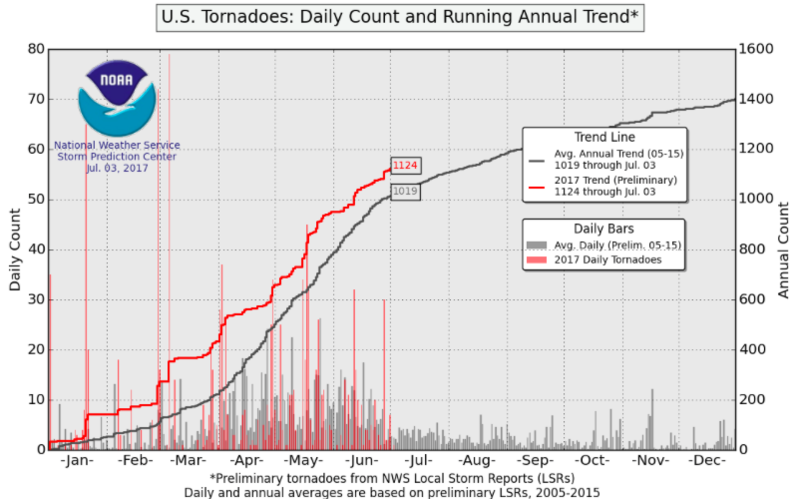 The report adds that through the end of May, tornado activity in the U.S. remained in the bottom 25th percentile of all years dating to the early 1950s. Check out I.I.I. facts and statistics on thunderstorms.